There’s been a lot of chat in the past couple of months about Millennial’s, and various ‘experts’ coming forward to say why they aren’t able to afford a house, or keep a job, or prosper in life. The most famous is this one from Steven Sinek on Millennial’s in the workplace. There’s been a range of ideas put forward as to how we can save for what we’ve been wishing for, from cutting down on a daily coffee to eliminating our beauty regimes, and stopping overseas travel. While it seems ludicrous to our grandparents that we would do all these things when trying to save for a house, are they now considered essentials in our daily life or can we afford to cut them out? One area that seems to be costing anyone who works a corporate job, which these days consists of much more than just the traditional 9-5pm, is food. On average if you spend $10 on takeaway lunch everyday, that’s $50 a week and $2,400 for a 48-week year. Compounding this is dinners out, with an average spent of $40 3 times a week, that’s $120. Per year that equates to $6,240 and this doesn’t take into account expensive weekend meals or holiday feasts. As we start to put financial and other goals on our list as we get older, saving starts to become that much more important. With compounded interest on that saving of $8,640 (lunches and three dinners out) per year that’s the equivalent to $47,741 over 5 years and $108,573 over 10 years. Throw your daily coffee into the mix and that’s quite a nice little savings jar! So how can we save $8,640 a year to do this? One answer to this: meal preparation. You do not have to be a body builder to nail meal prep, and you do not have to think of meal prep as just chicken and broccoli. The health benefits of meal preparation go beyond the financial savings that you’ll make. When you know what is going into your food you are in control of exactly what you’re eating, and there’s no secret sauces or hidden ingredients that are hindering your health goals. If you can just dedicate a few hours on the weekends to your meal prep the “I don’t have time or the energy” argument becomes a mute point. So how do you do it? 20 may not seem like a lot, but as you get into meal prepping you only use about 10-20 recipes for the whole year. You’ll find ones that are your favourite and that you have down pat and are easy to prepare. Focus on recipes that are quick and easy and require little preparation time. They should integrate your three key macros: protein, carbohydrates and fats in the correct proportions. It seems that knowing how to cook delicious and wholesome food has become a bit of a mystery. While many will argue that great cooking is an art, unlike other creative endeavours ANYONE can create good food. Learning from the pros is not only a fun way to experiment with food, but it also provides you with some great fundamental skills and will add to your recipe base. 3. Experiment with Herbs and Spices. If you want to make your food go from good to great, you need to get comfortable with using different flavours. Herbs and spices are the easiest and healthiest way to add depth and taste to your meals. You’ll start to learn what you like combining together and which flavours you prefer. If you want to really go above and beyond, you can start your own herb garden on your balcony. Having the fundamentals like basil, rosemary and thyme can give you an endless supply of herbs at your fingertips! 4. Dedicate 3 Hours a Week. When we cook throughout the week it can get tiring, messy and blowout into hours of preparation, cooking, and cleaning. If instead you set aside 3 hours on the weekend to do all of this, you cut down the time that you need to spend overall and particularly during the week when you arrive home from work. Set yourself up with your breakfast, lunch and dinner containers with everything cut up, cooked if possible, and ready to just be reheated or thrown in the oven. Our favourite tip is having glass jars with all your vegetables already chopped up so when you get home you just need to switch on the oven, throw them on a tray, and cook! Fortunately in this domain practice makes perfect. As you start to find the 10-15 recipes that you like each week, you’ll become more efficient and quicker at preparing those foods. 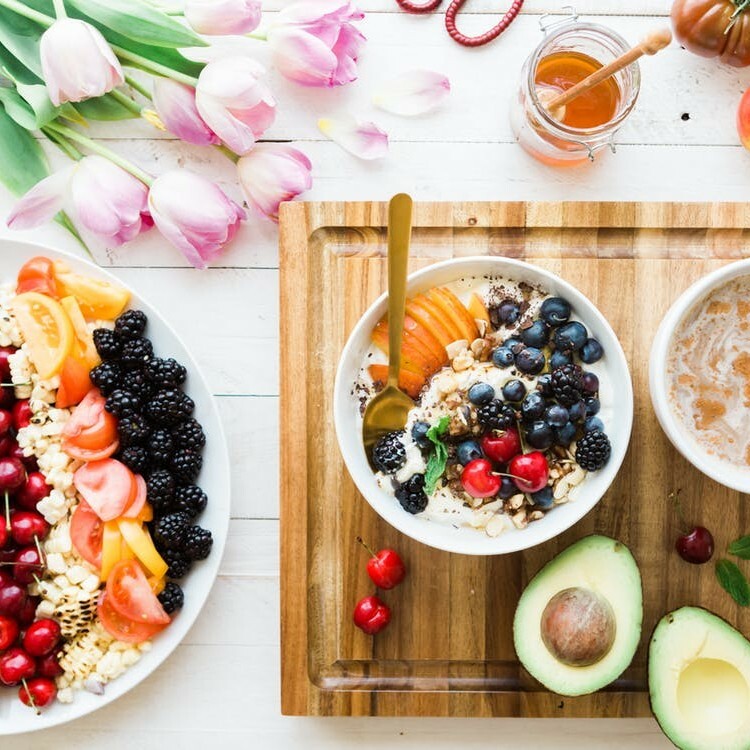 Make it a ritual that you dedicate the time to yourself on the weekends to be fuelling your body for the week with nutritious and healthy foods. Saving money is a great way to motivate yourself to eat healthy. Create a list of goals that you want to achieve with specific timeframes and see the dollars you are saving from meal preparation going towards helping you make them!